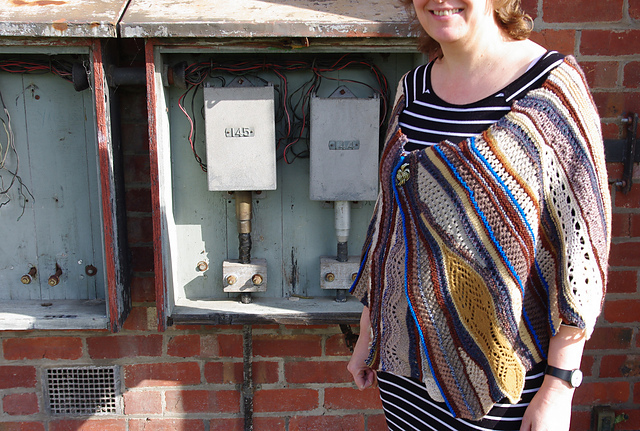 Thanks to the wonders of Ravelry, I have knitting friends all over the world I've never met in person. However like all knitting friends, we chat, encourage each other when the knitting mojo has fled and we are in a dreaded knitting slump, oooh and ahhh appropriately over each others finished objects and sometimes just plain marvel at those of us whose knitting transcends the ordinary to become art.... And we know each other well enough to dangle interesting opportunities where they are most likely to be snapped up. So my adventure in freeforming is all thanks to Rose who I originally met in VHOC (Village Hopelessly Over-committed). She enticed me down this particular rabbit hole. "Come and have a look at the IFFF (International Free Form Forum). 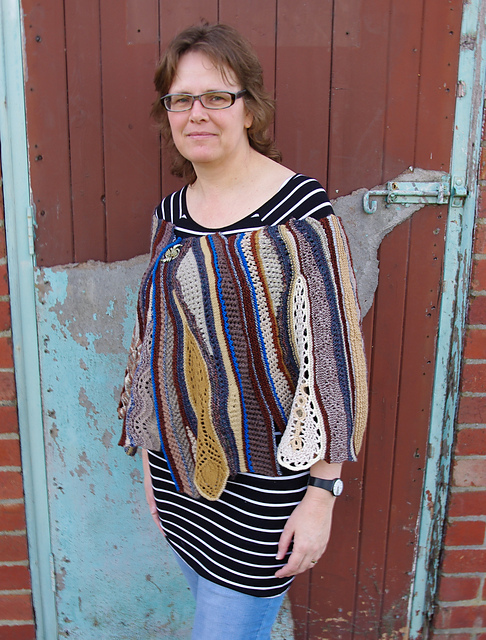 They are running an Adventures in Freeform Lace CAL / KAL in June and July. I think you'd love it...." So I went and looked. And all the pretty things and the friendly welcoming people hooked me right in. I knew what freeform was. 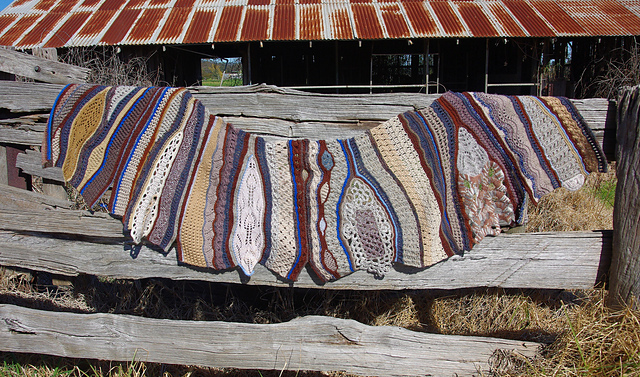 I'd had the pleasure of meeting Prudence Mapstone several times at Craft Shows in Melbourne and took a class with her a few years ago. There are scrumbles in the deep storage area of my UFOs. I had a plan to make a handbag. I have a mesh bag frame and Prudence's book on Freeform Handbags.... But it just never came together into a coherent idea. Prudence's idea of scrumbling seemed to work better in crochet than knitting (and I would always chose knitting over crochet). 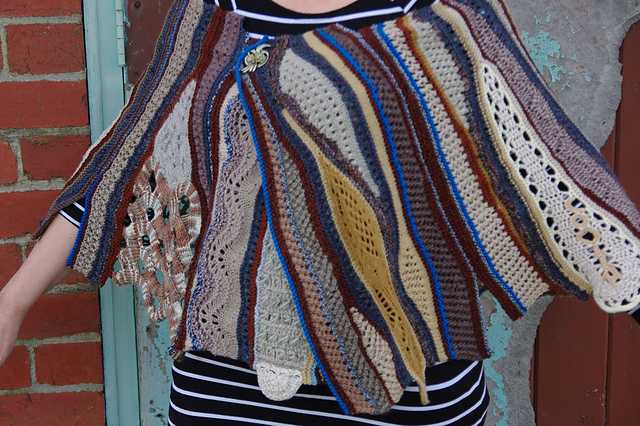 The idea was to make a lace shawl using a series of crochet and knit stitch prompts provided weekly. 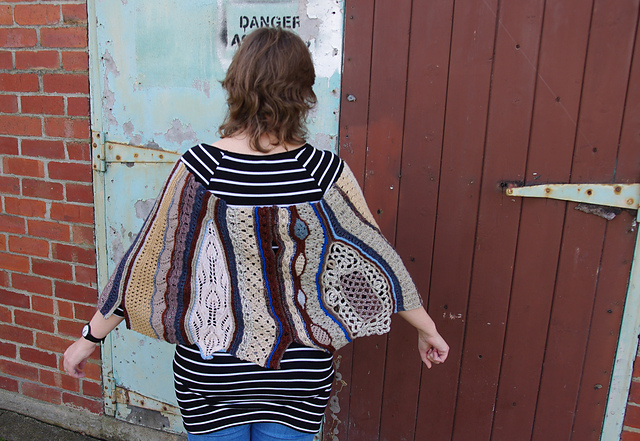 The suggestion was to loosely base it on Wingspan which is made from a series of offset triangles formed with short rows. The other design inspiration was Dreambird which has been near the top of my queue for a while now. 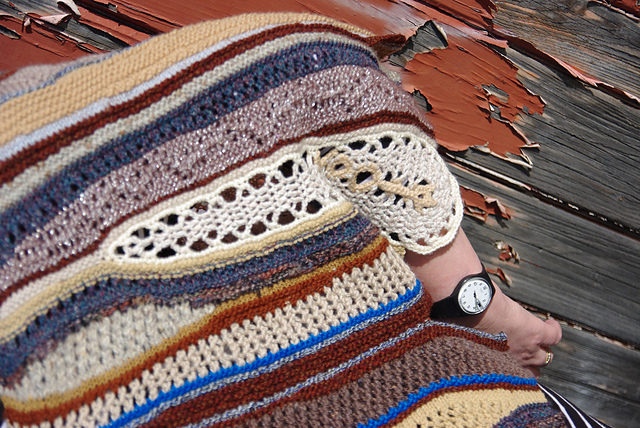 Dreambird's encased short row feathers banded in strips of garter stitch just clicked somehow. I could so see a lace Dreambird with a faggoted / trellis framework and delicate lace feathers. And that was my inspiration for beginning to design this - feathers encased in ribs of garter stitch, modularly constructed as a series of panels. This was my original inspiration for the colour palette. 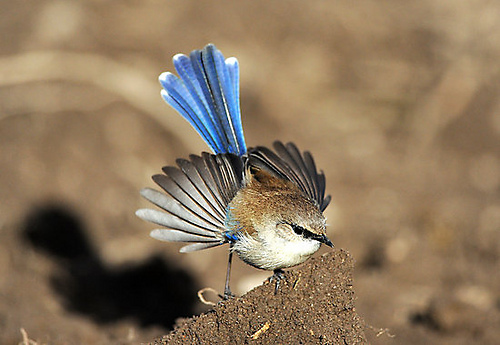 This little guy is blue wren. They are fairly common in regional Victoria where I live. My previous office at the University had large windows with a broad outside ledge that were mirror coated on the outside. One of these little guys came by almost daily to play with his reflection. I was drawn to the colours of these birds' wings: complex shades of brown and a flash of brilliant almost metallic blue. 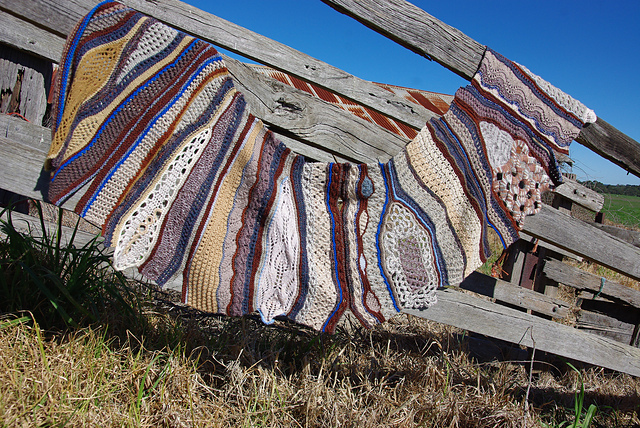 Another post is coming on the design and construction logistics of the shawl. 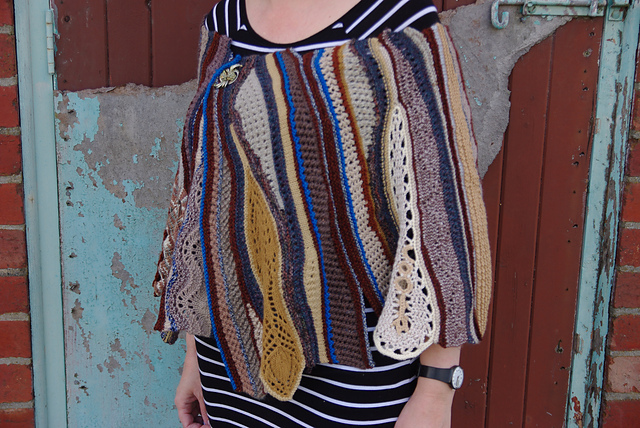 The rest of this one is just going to be the eye candy pictures of the finished object... (Thanks to the boy for the shots of me wearing it. And yes, I do actually wear it (in public - to work and out shopping, etc...). It's amazingly comfortable and just sits so perfectly on the shoulders. The length has turned out just right too. Not too long to get in the way). And a big thank you to all the lovely ladies of IFF (especially Melba, Jorel and Loren - the group moderators). You have inspired me to complete my first freeform garment! (I still can't quite believe I have). You've pushed my gently but firmly out of my comfort zone. (Kind of like how mother birds push baby birds out the nest to teach them to fly). You've made me realise I already have my own unique style and it's worth refining but not really changing. And it's been a really fun journey.